WSOU, which began broadcasting in 1948, is the student-run, award-winning radio station of Seton Hall University. Since 1986, WSOU has programmed a hard rock format and the station has developed a national reputation as an industry leader in breaking new bands. 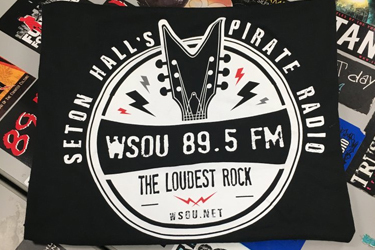 WSOU gave the first area airtime, and in some cases the first-ever airplay, to bands such as Pearl Jam, Smashing Pumpkins, Rage Against the Machine, Korn, My Chemical Romance and Five Finger Death Punch, among many others. WSOU is also the broadcast home for Seton Hall athletics and airs religious, public affairs and ethnic programming. Broadcasting from Seton Hall’s South Orange campus, the station’s signal reaches all five boroughs of New York City and much of northern and central of New Jersey. In addition to broadcasting on 89.5 FM, WSOU streams online at www.wsou.net and on www.iHeartRadio.com. WSOU is licensed by the Federal Communication Commission (FCC) to broadcast as non-commercial educational radio station (NCE) on an analog FM frequency of 89.5. As one of several early FM stations, WSOU is required by FCC to observe special technical rules in its broadcast operations. The station is also licensed by the FCC to broadcast digitally (HD-Radio) and is authorized to broadcast two distinct digital channels: WSOU-HD and WSOU-HD2. The latter is the station’s 24/7 Catholic programming service. WSOU operates 24/7 to produce 8,760 hours of programming, reaching a weekly over the air audience of more than 120,000 listeners, while thousands of others listen to WSOU’s audio streams each month. 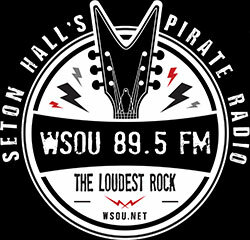 WSOU’s main audience is comprised of individuals who listen to the station’s Active Rock format. The core demographic for this group of listeners is 12 to 34 years old, followed by listeners 35 to 54 years old. This audience is more male than female. WSOU’s secondary audience is largely comprised of Seton Hall alumni, parents, students, employees, and friends who tune in for the station’s broadcast of Seton Hall athletics. It is this large listener base, with programming that reaches both a general audience and a more focused Seton Hall audience, that is WSOU’s most valuable asset, and the programming that serves these listeners is one of Seton Hall’s greatest strengths. 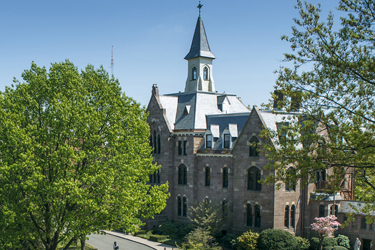 The station is staffed around the clock by Seton Hall students and there are more than 100 undergraduate and graduate students that comprise the student staff of WSOU. The station airs annually nearly 10,000 newscasts covering local, national and international news, a vital service to our audience, as many listeners report that the station is their only source for broadcast news. Each week, WSOU airs 12 hours of programming designed to directly serve the information and entertainment needs of under-served audiences, including the local Armenian, Arab, Pacific-Islander and Caribbean communities. More than 200 band and individual musician interviews are conducted by the station each year, many spotlighting emerging and local talent. These interviews allow students to hone their skills. The station’s daily operations are overseen a by a team of eight student managers. In short, students are involved in all aspects of WSOU which provides Seton Hall students an opportunity to be part of a unique and vibrant experiential-learning environment. It is the mission of WSOU to advance the broadest educational goals of Seton Hall University through the operation of a full-service, professionally managed, student-run radio station. WSOU is committed to strengthening Seton Hall’s Catholic and academic identity, developing a culture of engagement and service, and meeting the experiential educational and cultural needs of the campus and the community at large. WSOU educates and entertains through music, news, sports, and public affairs; provides a hands-on learning experience for students; promotes a diverse and collaborative working environment; and encourages students and listeners to pursue a quest for lifelong learning sustained by Catholic values. WSOU will remain a national leader in college broadcasting and will continue to be consistently ranked in the top tier of student-run electronic media outlets. In its endeavors, WSOU will integrate opportunities for academic excellence and servant leadership for students, employees, and volunteers. WSOU will provide students with an experience that incorporates technology and Catholic values to enhance student life and learning. WSOU will respect and acknowledge its unique position as an industry-recognized “heritage radio station” while maintaining a 21st century multi-media platform. A commitment to “not taking ourselves too seriously”.